Southwest Grilled Chicken Salad with Candied Bacon. 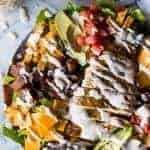 This salad is loaded with grilled chicken, fresh juicy tomato, creamy avocado, crunchy tortilla strips, black beans, cheddar cheese, and sweet and salty candied bacon. 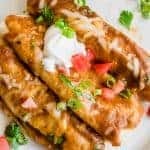 All drizzled with a homemade salsa ranch that is truly addicting! Seeing as how it’s January and I’m feeling the pressure to eat more salads, I’m here to share my favorite salad with you! 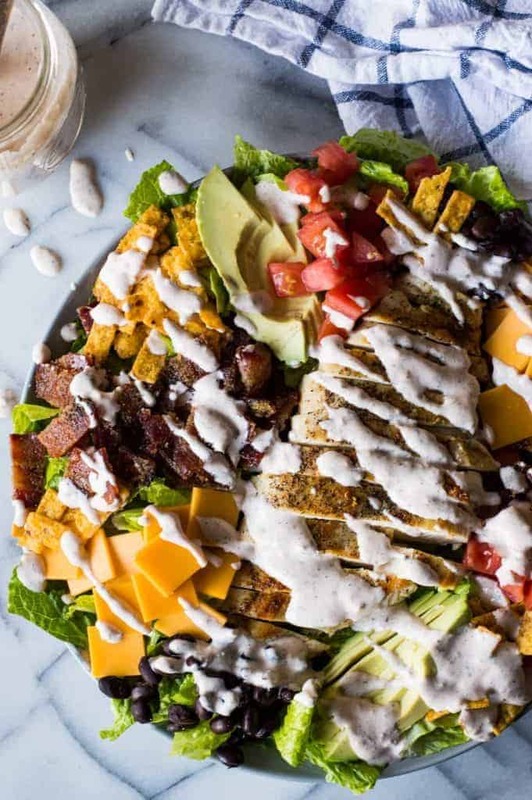 This Southwest Grilled Chicken Salad with candied bacon is kind of the salad of my dreams. It’s based on my all time favorite to go meal that I get from our local Market Street store, the Texas Toss salad. And I have to say I think I may like this homemade version even better than the one I get from the store! Other than the fact that when I buy it I have absolutely no dishes to do. But I can handle dishes in exchange for some absolute deliciousness. This salad is loaded up with all kinds of goods..including the candied bacon!! It really makes the salad. Just the hint of maple and sweetness mixed with the savory chicken and other salad toppings. And don’t be worried, it’s super easy to make. The hardest part is not snacking on it so that it actually makes it into the salad. 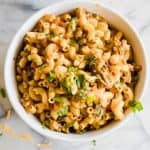 If you have some chicken on hand you can use that in this salad, or rotisserie chicken, or even packaged grilled chicken strips. Anything to save time. If you want to grill your own chicken breast, I have an easy method included in the recipe for you below. 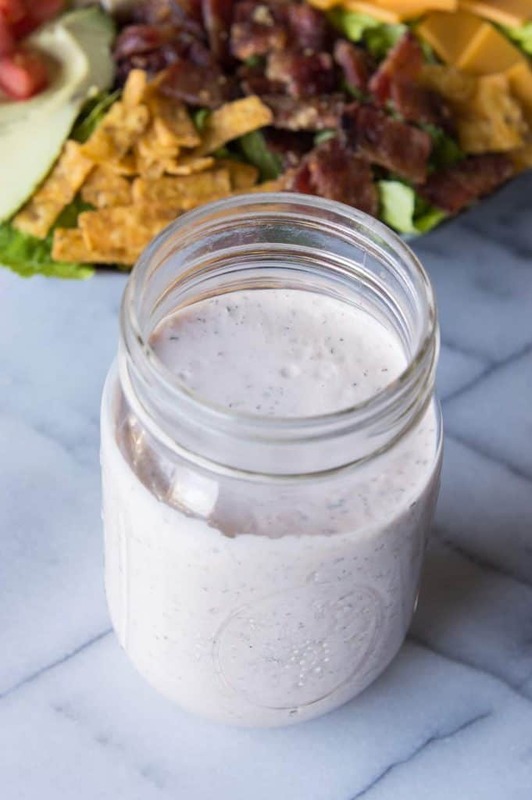 Top all of this with a creamy and delicious homemade salsa ranch dressing and there’s no way this salad will disappoint. It’s hearty enough to be a complete meal. And there is a hefty serving of greens in there too. Trust me. 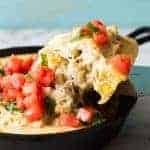 WANT TO TRY THIS SHEET PAN CHICKEN FAJITAS RECIPE? PIN IT to your SALAD, or CHICKEN Board to SAVE FOR LATER! 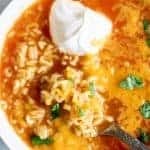 To prepare the salsa ranch add all the ingredients to a food processor (affiliate link) or blender and pulse for about 20 seconds or until all the ingredients are combined. Set aside. Store in refrigerator in a sealed container. To prepare the candied bacon preheat oven to 400 degrees. Line a large baking sheet with foil and place a wire rack on top, so the rack is over the baking sheet, but not directly on the baking sheet bottom. 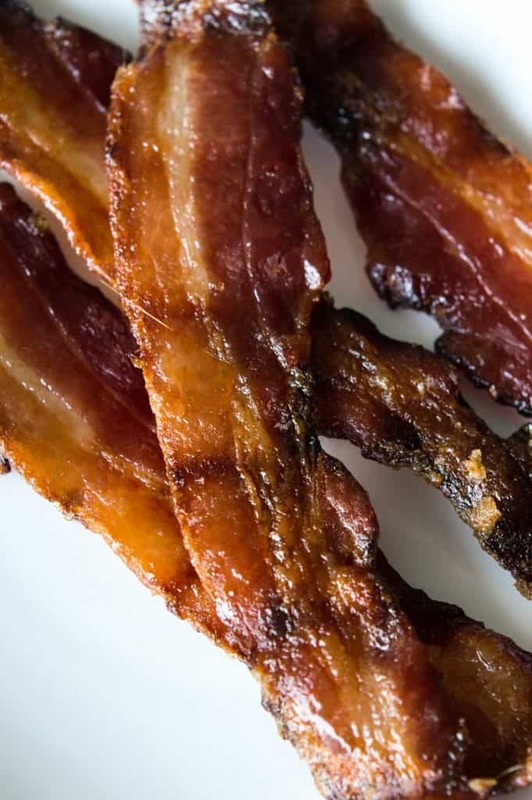 Lay the thick cut bacon strips on the wire rack. Brush with the maple syrup and sprinkle the brown sugar on top. Bake for about 15 minutes. Turn the bacon strips over, brush the tops with the maple syrup and sprinkle with the remaining brown sugar. Bake for an additional 10 minutes or until desired doneness. Remove the bacon strips to cool on a plate lined with paper towels. The bacon will crisp and harden as it cools. Once slightly cooled, dice into small pieces and set aside for the salad. To prepare the grilled chicken, pour the olive oil into a small skillet over medium heat. Once the oil is heated add the chicken breast. Sprinkle with salt and pepper. Cook for about 6-7 minutes then turn the chicken over to continue cooking on the other side. Sprinkle the top with the remaining salt and pepper. Once chicken is cooked through, no longer pink on the inside, remove the chicken to a cutting board and allow to cool for about 5 minutes prior to slicing. 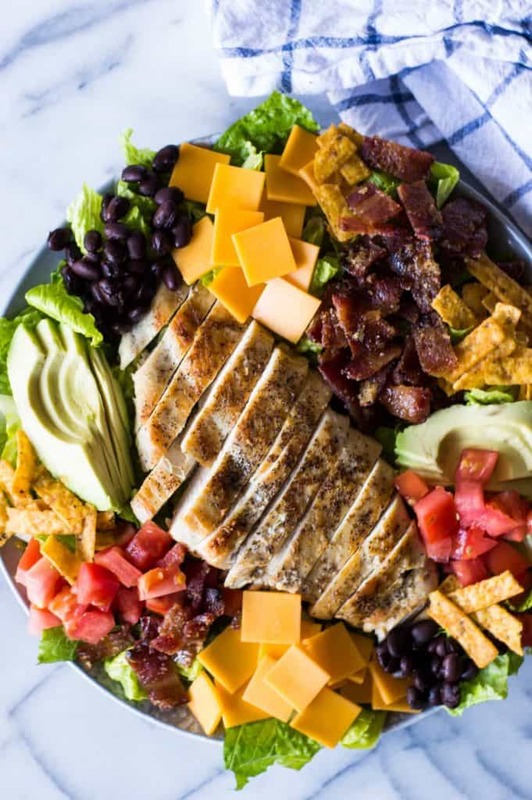 To assemble the salad, lay the romaine down, top with the grilled chicken, candied bacon, diced tomato, black beans, avocado, tortilla strips and cheese. Drizzle with the salsa ranch and serve immediately. Enjoy! 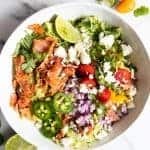 The recipe Southwest Grilled Chicken Salad with Candied Bacon first appeared on The Recipe Critic.